Any quantity available for $7.50 per bar over spot! Bars will be varied mint and condition. They may or may not arrive in assay cards. Condition will vary and photo is example only. Gold bars have skyrocketed in popularity in the 21st century due to the record-high prices for all precious metals. Gold has led the way in terms of popularity and pricing, but that doesnt mean there isnt an affordable option for every investor and collector to choose from. JM Bullion offers a range of 1 Gram Varied Gold Bars to meet the demands and budget of any investor. Contains 1 Gram (.0321 oz) of .999 or .9999 pure gold. Unique designs available on some to attract collectors. Low premium over spot pricing. Most ship in sealed plastic packaging. There are two primary reasons for the availability and popularity of 1 Gram Gold Bars. First and foremost, gold bars are available at lower premiums over the spot price of the metal. Because of the lower production costs and the mints producing these gold bars, it is easier for more investors to get in the market through the purchase of affordable bars. 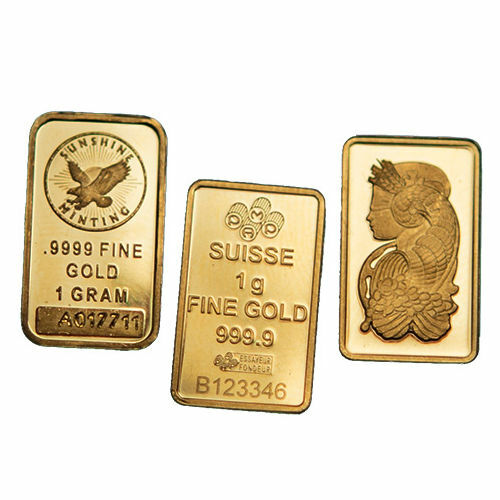 Secondly, 1 Gram Gold Bars are popular because of their smaller size. It makes them easier to store and transport, when necessary, than larger gold bars. When it comes to selection, youll find two different types of 1 Gram Gold Bars on the market today. There are those which bear simple markings and logos from the mints that produce them, and there are those created with a sense of design and attraction in the production of the bar. For example, the 1 Gram Perth Mint Gold Bar offers a simple design that includes the logo for the mint, which consists of an elegant swan in the center of a circular design with the words The Perth Mint, Australia engraved around it. The purity (.9999 pure gold), metal content, and weight are engraved on the same side. The reverse side bears the repeating image of a kangaroo. On the other hand, the 1 Gram PAMP Suisse Fortuna Gold Bar offers the most sough-after design in gold bars today. On the obverse is an intricate image of the Roman goddess of fortune. Wearing a blindfold and cornucopia atop her head, a bounty of riches flows forth to her hands at the bottom of the bar. If you have further questions about available 1 Gram Varied Gold Bars from JM Bullion, please contact us at 800-276-6508, chat with us online, or send us an email. If you are interested in similar products, view our selection of Gram-Kilo Gold Bars.